Natsu Iro Egao de 1, 2, Jump! 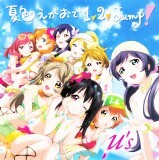 This CD contains songs and audio drama for the Love Live (ラブライブ) School Idol Project. Songs by the group Muse (μ's). The lyrics booklet has color photos of the Muse seiyuu.